Learn from the best. Here’s the first of a four-part series on storytelling from Ira Glass of This American Life. Here he begins with the two fundamental building blocks of good story. A skill worth developing as far as you are capable, although few of us will reach his level of mastery. I’ve been part of the private beta of Gist for the last several months and am still wrapping my head around it. They’ve just opened up the beta for wide consumption. Here’s the announcement from CEO T.A. McCann. Today, Gist brings you a better way to communicate and build stronger business relationships. After a year in limited release and with the input of over 10,000 beta users, we have created a new system to aggregate, organize, prioritize and focus your time on the most important things. We connect to your inbox or social networks to discover your key contacts and companies, automatically prioritize them and bring together personal communications, news, blogs, and the real-time web all into one neat package. Gist is a game changer and I am proud to be part of the team that has brought it from concept to a robust and useful solution. We are privileged to work in such an exciting and evolving space, with great investors and,most importantly, incredible users who will continue to help us focus on what is most important and most valuable. Thank you for the privilege to make a radical shift! The tightrope act I was going to have to attempt was made possible only by Bonforte’s Farleyfile, perhaps the best one ever compiled. Farley was a political manager of the twentieth century, of Eisenhower I believe, and the method he invented for handling the personal relations of politics was as revolutionary as the German invention of staff command was to warfare. Yet I had never heard of the device until Penny showed me Bonforte’s. When available, a photo was included. There might, or might not, be "below-the-line" data, i.e. information which had been researched rather than learn directly by Bonforte. It depended on the political importance of the person. In some cases the "below-the-line" part was a formal biography running to thousands of words. "God’s mercy child! I tried to tell you this job could not be done. How could anyone memorize all that?" "Why, you can’t, of course." "You just said that this was what he remembered about his friends and acquaintances." "Not quite. I said that this is what he wanted to remember. But since he can’t, not possibly, this is how he does it…. "These are things he would like to remember if his memory were perfect. Since it isn’t, it is no more phony to do it this way than it is to use a tickler file in order not to forget a friend’s birthday — that’s what it is: a giant tickler file, to cover anything." Most of us are called on to cope with an order of magnitude or two more relationships than our parents or grandparents ever contemplated. Applications and information management services like Gist are becoming absolutely essential if we hope to cope with those demands. The folks at MindJet officially have launched their latest upgrade to MindManager Pro, now at version 7. Here’s their press release, although you’ll probably find Chuck Frey’s preview comments more useful. I’m still getting used to the Ribbon interface, but that is also the case for Office 2007. If you’re using this tool, you’ll want to upgrade. If you haven’t started mindmapping, today would be a good day to get started. Use the structure of the map to address different levels of audience, so that you don’t have to reveal more than they really need. 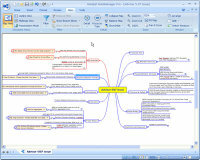 Software mind mapping tools will let you show or hide different levels of topics. Provided you use statements instead of headings, this lets you “layer” your presentation very effectively. Think about the map as a set of donut-shaped rings. The ring nearest the centre of the map is for your executive audience, who have short attention spans and grasp big ideas quickly. The next ring is for management, who are going to need a better understanding of the implications in order to deliver it. The outer ring is for the people who actually do the work, who will need real details. The true benefits of the tree structure become evident here, because you can position detail in the context of bigger ideas. When presenting, start at the one o’clock main topic and walk through your map in a spiral, addressing the executive level first, then the management level, then the detail if it is appropriate. This takes you on a complete tour of your map in at least three passes, which helps your audience feel comfortable from the outset about the scope of your presentation, and critically, the way it is represented by your map. This might disappoint the few who enjoy suspense and surprises, so it is up to you as a presenter to make it entertaining and engaging in other ways, instead of by playing with the content. That’s like playing with food, and you can remember being yelled at for that. If your audience is still with you when you complete your tour through the management level, then they are ready for the detail. If you have already lost their good will, or are running out of time, then more detail would not have helped and could even have set you back. So when using software mind maps to prepare and deliver presentations, use statements, translate different audience levels to layers, and develop a spiral route through your map to keep your audience on track. And don’t forget the donuts. This video clip of Tony Buzan on mindmapping is making the rounds. Jack Vinson and Chuck Frey also pointed it out. According to Buzan there’s a right way and, by implication, a wrong way to draw mindmaps. I suspect Buzan would give me low marks on how I make use of his technique. What good is a tool, if you can’t twist it to your own purposes? In particular, I ignore the “one word per branch” guideline in favor of one chunk per branch. Regardless, I am still a proponent of the technique, both manually and with whatever software tools best suit your style. And Buzan’s Mind Map Book remains your best starting point. Really great YouTube clip of Tony Buzan holding forth on the features and benefits of mindmapping. Fascinating stuff from the master himself…. Relatedly, for utter information overload, check out this list of mindmapping tools. Or, check out this relatively recent list of narrowed down options. That second list turned me onto Gliffy, which is best described as free Visio in a browser–very excellent tool for diagramming, but I don’t think it’d port well to mindmapping. Lisa’s blog is full of good advice. I have long been an advocate of full text feeds for blogs. Here’s some data to support the contention from Amit Agarwal. I love Amit Agarwal s analysis on the full-text vs. partial text debate. I HATE partial text feeds. I am subscribing to a few now (Dan Farber, for instance) but I find I link to them far less often than people who give me full text feeds. What does that do? Well, read Amit s analysis. And, yes, I did steal Amit s content and put it on my link blog. Here’s a pointer to an interesting tool for working with timeline data. Part of a larger research project at MIT called SIMILE that also looks worth investigating. a AJAX widget for visualizing time-based events from a simple XML file, without the need for software installation, server-side or client-side. users can pan the timeline by dragging it horizontally. see also google trends & timeline of trends & history of programming languages.